Note from shop owner Thanks for your interest in my shop. I'm taking a break from offering the finest pet tag silencers on the market. It's worth the wait! Thanks for your interest in my shop. I'm taking a break from offering the finest pet tag silencers on the market. It's worth the wait! Perfect. Love it, fits perfectly on the collars and the dogs don't mind it al all. Want to get more. Exactly what I was looking for, perfect!!! No more dangling tags. Ready to order more. This item solved our problem of jingling dog tags. Everything is nice and neat plus the printing on the tags won't get worn off now. I liked these so much, I bought 2 of them. Great product with timely delivery. It was also great to be able to have the items personalized for each dog. I love the design of this tag silencer! The tags do not have to be on a ring at all, just slide them in the pouch, snap it closed, and you are done! No more waking up up to a noisy dog collar! Quality and value are what sets us apart. The perfect solution to pet tag noise. Soft and secure. Made from the best neoprene available and secured with marine grade snap, stainless split ring and sewn with bonded nylon thread. Wholesale opportunities are available. Superior packaging and exceptional service make offering Fido an easy choice. My passion is creating anything and everything. I simply enjoy others enjoying what i create. I only use the best materials so you recieve a quality item that will last for years. Thank you for all the support. Riley inspired the creation of FIDO Pet Tag Silencers®. Custom leather orders such as personalize stamping cannot be returned if you originally spelled the name wrong when ordering. Neoprene silencers are water tolerant and can be hand washed with mild soap and air dried. Leather can be kept soft and long lasting by using a leather conditioner to keep it looking new. If dirty use a clean damp towel and wipe off and air dry. Then apply leather conditioner. 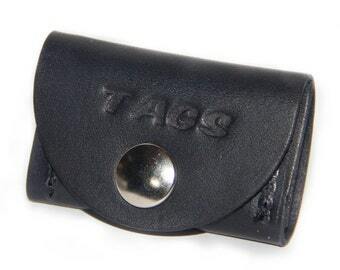 Small breed tag silencers are made so tags fit snug. Carefully insert tags by stretching sides as you insert into pouch and push completely into bottom of pouch then snap closed. No hassle returns. Returns are excepted up to 30 days after purchase. Item must be returned in non-used original condition and original packaging. Due to the nature of this product any used or appearance of being used will not be refunded (no exceptions). All shipping cost are buyers responsibility. DEFECTIVE PRODUCT: We believe in our products. Submitted pictures of defects are required prior to returning any product. After 30 days no returns are excepted. No exceptions. Money back does not include any shipping cost incurred unless defective. Product will be remade and reshipped or refund can be requested. Credit will return back to original payment method. Yes we sell wholesale. Fido Pet Tag Silencers are a wonderful addition to your retail offerings. With multiple five star reviews you can be assured your receiving a quality product. I look forward to working with you. Register as a Etsy Wholesale buyer to get access to our special pricing.